’Angriya’ will set sail from Mumbai on 12 October. 'Angriya' sets sail next weekshould you get on board? The 400-passenger carrier is named after Kanhoji Angre, the first admiral of the Maratha Navy, who came to be known as “Shivaji of the Indian Ocean" for valiantly protecting the western coast from Portuguese and British invasions. On board are 104 cabins (from dorms and Japanese-style pods to more spacious family suites), two restaurants, six bars, a lounge, a cosy reading area and an infinity pool. You can shuffle between different entertainment options for the duration of your time on board—join the revelry in the Fathom lounge, settle down with a cocktail on the poolside deck, or head to the uppermost Monkey deck, restricted to premium category passengers, to inspect the night sky. Ticket prices range from ₹ 4,300 for a dorm to ₹ 7,650 for a double room (plus ₹ 2,000 for meals), making it as expensive as off-season flights, but more time-consuming. What you get in return for the roughly 16-hour journey (5pm -9am) to South Goa’s Mormugao port is flattering sunrise and sunset views, an infinity pool that creates the illusion of floating in the sea, and the possibility of spotting dolphins along the way. The dining options on board are limited—both restaurants will serve the same Konkani-style buffet dinner with some Chinese and Continental fare; the only a la carte options are finger foods. And while Angriya is billed as a luxury cruise liner, it might be best to manage expectations. 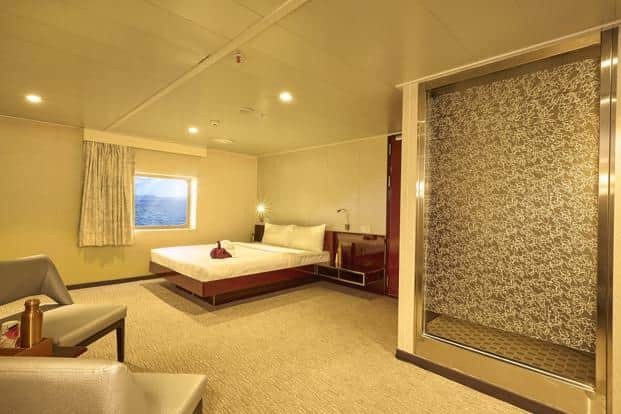 While it ticks all the right boxes with amenities like on-board massages, the smart but minimal rooms and functional décor place it closer to a dressed-up ferry service than a seven-star liner. Angriya’s maiden voyage will also reopen a once popular sea route between the two ports.“This was a dream for (Angriya) captain Nitin Dhond," says Leena Kamat Prabhu, managing director of Angriya Sea Eagle Pvt. Ltd. “Our family is from Goa, and back in the 1970s , this was a regular route for Goans to come to Mumbai and vice versa. It for this nostalgia and a passion for the sea that we decided to start this cruise." 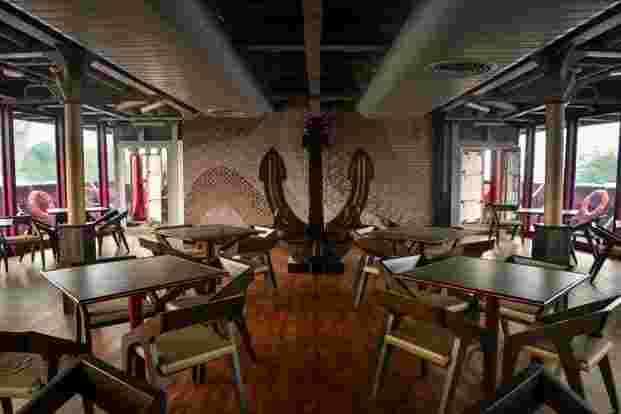 With Angriya, the marine enthusiast also hopes to offer Indian travellers an easy introduction to the underexplored concept of cruise vacations. “A luxury cruise experience takes nothing less than five days. This overnight journey is a way of experiencing marine travel, which is not common in India," she says.